An ounce of Prevention is worth a pound of cure. You can save your pet's teeth rather than have them extracted if you provide preventative dental care. You can make a difference by recognizing problems early. Why not start today? It is simple, look in your pet's mouth every day and brush their teeth, too. If anything looks or smells different, contact us for a Oral Health Screening as soon as possible. Preventative dental care will provide early diagnosis and treatment. Preventative dental care starts with teeth cleaning in a comprehensive way, we call COHAT. We diagnose first and treat optimally! It is unfortunate, but many oral health problems are missed during routine wellness exams. How is this possible? The reasons are related to: not enough time, insufficient dentistry training, and of course, a wiggly, excited, or fearful pet. How much time can be focussed on oral health during a general health exam? The vet looks at the eyes, ears, nose, throat, a lapping tongue, skin and they examine the belly, legs, feet, heart and lungs. Discussions then involve general health problems and answers to your questions. Blood draws and shots make many pets even more reluctant to sit through an adequate oral health exam. Wow, many factors affect the ability to examine the 30 teeth of the adult cat or 42 teeth of the adult dog. This all goes to show, there is a lot to know; and many oral problems are missed on a general health exam. Dr. Kressin is a board certified veterinary dentist. He is trained to recognize problems, and he knows what to look for. This takes less time, and is better accepted by excited or fearful pets. You will see the difference in our Oral Health Screening Exams. You go to your physician for your general health, and to your dentist for your oral health. As an animal advocate, choose Dr. Kressin for your pets preventative dentistry. Optimal oral health precedes excellent general health and overall wellness. We promise to diagnose first and to treat optimally! Focusing on preventative veterinary dentistry means emphasizing the importance of oral health screenings and routine dental cleanings. What are the benefits of this focus and why are these services with Animal Dentistry and Oral Surgery Specialists different? 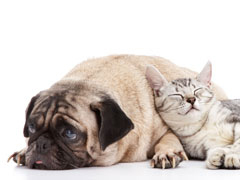 Together we can improve your pets oral health. Recognize, diagnose and treat oral cancer early to save lives!